Biography*: Isabella of Angoulême (French: Isabelle d'Angoulême, IPA: [izab?l d?~gul?m]; c.1188 – 31 May 1246) was queen consort of England as the second wife of King John from 1200 until John's death in 1216. She had five children by the king including his heir, later Henry III. In 1220, Isabella married Hugh X of Lusignan, Count of La Marche, by whom she had another nine children. Some people claim that Isabella formed a conspiracy against King Louis IX of France in 1241, after being publicly snubbed by his mother, Blanche of Castile for whom she had a deep-seated hatred. In 1244, after the plot had failed, Isabella was accused of attempting to poison the king, and to avoid arrest, sought refuge in Fontevraud Abbey where she died two years later, but none of this can be confirmed. She was the only daughter and heir of Aymer Taillefer, Count of Angoulême, by Alice of Courtenay, who was sister of Peter II of Courtenay, Latin Emperor of Constantinople and granddaughter of King Louis VI of France. Isabella became Countess of Angoulême in her own right on 16 June 1202, by which time she was already queen of England. Her marriage to King John took place on 24 August 1200, at Bordeaux, a year after he annulled his first marriage to Isabel of Gloucester. She was crowned queen in an elaborate ceremony on 9 October at Westminster Abbey in London. Isabella was originally betrothed to Hugh IX le Brun, Count of Lusignan, son of the then Count of La Marche. As a result of John's temerity in taking her as his second wife, King Philip II of France confiscated all of their French lands, and armed conflict ensued. At the time of her marriage to John, the blonde and blue-eyed 12-year-old Isabella was already renowned for her beauty and has sometimes been called the Helen of the Middle Ages by historians. Isabella was much younger than her husband and possessed a volatile temper to match his own. King John, however, was deeply infatuated with his young, beautiful wife; he neglected his state affairs to spend time with Isabella, often remaining in bed with her until noon, although it was the custom for kings to rise at five o'clock in the morning to commence their duties. The common people began to term her a "siren" or "Messalina", although they were pleased with her beauty. Her mother-in-law, Eleanor of Aquitaine readily accepted her as John's wife. On 1 October 1207 at Winchester Castle, Isabella gave birth to a son and heir who was named Henry after the King's father, Henry II. He was quickly followed by another son, Richard, and three daughters, Joan, Isabel, and Eleanor. All five children survived into adulthood, and would make illustrious marriages; all but Joan would produce offspring of their own. When King John died in October 1216, Isabella's first act was to arrange the speedy coronation of her nine-year-old son at the city of Gloucester on 28 October. As the royal crown had recently been lost in The Wash, along with the rest of King John's treasure, she supplied her own golden circlet to be used in lieu of a crown. The following July, less than a year after his crowning as King Henry III of England, she left him in the care of his regent, William Marshal, 1st Earl of Pembroke and returned to France to assume control of her inheritance of Angoulême. 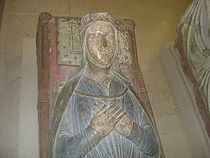 In the spring of 1220, she married Hugh X of Lusignan, "le Brun", Seigneur de Luisignan, Count of La Marche, the son of Hugh IX, to whom she had been betrothed before her marriage to King John. It had been previously arranged that her eldest daughter Joan should marry Hugh, and the little girl was being brought up at the Lusignan court in preparation for her marriage. Hugh, however, upon seeing Isabella, whose beauty had not diminished, preferred the girl's mother. Princess Joan was provided with another husband, King Alexander II of Scotland, whom she wed in 1221. Isabella had married Hugh without waiting to receive the consent of the King's council in England, which was the required procedure for a former Queen of England, as the Council had the power to not only choose the Queen Dowager's second husband, but to decide whether or not she should be allowed to marry at all. Isabella's flouting of this law caused the Council to confiscate her dower lands and stop the payment of her pension. Isabella and her husband retaliated by threatening to keep Princess Joan, who had been promised in marriage to the King of Scotland, in France. The council first responded by sending furious letters, signed in the name of young King Henry, to the Pope, urging him to excommunicate Isabella and her husband, but then decided to come to terms with Isabella, as to avoid conflict with the Scottish king, who was eager to receive his bride. Isabella was granted, in compensation for her dower lands in Normandy, the stannaries in Devon and the revenue of Aylesbury for a period of four years. She also received £3000 pounds as payment for arrears in her pension. By Hugh X, Isabella had nine more children. Their eldest son Hugh XI of Lusignan succeeded his father as Count of La Marche and Count of Angoulême in 1249. Isabella´s children from her past marriage continued their lives in England. Described as "vain, capricious, and troublesome", Isabella could not reconcile herself with her less prominent position in France. Though Queen dowager of England, Isabella was now mostly regarded as a mere Countess of La Marche and had to give precedence to other women. In 1241, when Isabella and Hugh were summoned to the French court to swear fealty to King Louis IX of France's brother, Alphonse, who had been invested as Count of Poitou, their mother, the Queen Dowager Blanche openly snubbed her. This so infuriated Isabella, who had a deep-seated hatred of Blanche due to the latter having fervently supported the French invasion of England during the First Barons' War in May 1216, that she began to actively conspire against King Louis. Isabella and her husband, along with other disgruntled nobles, including her son-in-law Raymond VII of Toulouse, sought to create an English-backed confederacy which united the provinces of the south and west against the French king. In 1244, after the confederacy had failed and Hugh had made peace with King Louis, two royal cooks were arrested for attempting to poison the King; upon questioning they confessed to having been in Isabella's pay. Before Isabella could be taken into custody, she fled to Fontevraud Abbey, where she died on 31 May 1246. By her own prior arrangement, she was first buried in the Abbey's churchyard, as an act of repentance for her many misdeeds. On a visit to Fontevraud, her son King Henry III of England was shocked to find her buried outside the Abbey and ordered her immediately moved inside. She was finally placed beside Henry II and Eleanor of Aquitaine. Afterwards, most of her many Lusignan children, having few prospects in France, set sail for England and the court of Henry, their half-brother. King Henry III of England (1 October 1207 – 16 November 1272). Married Eleanor of Provence, by whom he had issue, including his heir, King Edward I of England. Richard, Earl of Cornwall and King of the Romans (5 January 1209 – 2 April 1272). Married firstly Isabel Marshal, secondly Sanchia of Provence, and thirdly Beatrice of Falkenburg. Had issue. Joan (22 July 1210 – 1238), the wife of King Alexander II of Scotland. Her marriage was childless. Isabella (1214–1241), the wife of Emperor Frederick II, by whom she had issue. Eleanor (1215–1275), who would marry firstly William Marshal, 2nd Earl of Pembroke; and secondly Simon de Montfort, 6th Earl of Leicester, by whom she had issue. Hugh XI of Lusignan (1221–1250), Count of La Marche and Count of Angoulême. Married Yolande de Dreux, Countess of Penthièvre and of Porhoet, by whom he had issue. Agnès de Lusignan (1223–1269). Married William II de Chauvigny (d. 1270), and had issue. Alice of Lusignan (1224 – 9 February 1256). Married John de Warenne, 6th Earl of Surrey, by whom she had issue. Guy of Lusignan (c. 1225 – 1264), killed at the Battle of Lewes. (Tufton Beamish maintains that he escaped to France after the Battle of Lewes and died there in 1269). Geoffrey of Lusignan (c. 1226 – 1274). Married in 1259 Jeanne, Viscountess of Châtellerault, by whom he had issue. William of Lusignan (c. 1228 – 1296). 1st Earl of Pembroke. Married Joan de Munchensi, by whom he issue. Biography*: He was also known as Eudes. He gained the title of Comte d'Orléans. Odo I (French: Eudes; also Hodo, Uodo, or Udo in contemporary Latin) (died 834) was the Count of Orléans (comes Aurelianensium) following the final deposition of Matfrid until his own deposition a few years later. He belonged to the Udalriching family and was a son of Adrian, who had also held the county of Orléans, and possibly of Waldrada, a Nibelungid. Odo first appears as an imperial legate to the Eastern Saxons in 810, when he was captured by the Wilzi. In 811, as count (comes), according to the Annales Fuldenses, he signed a peace treaty with the Vikings. According to the Vita Hludowici, in 827, he was named to replace the deposed Matfrid in Orléans. Odo, along with Heribert, a relative, possibly his cousin, were exiled in April 830 by Lothair I and Orléans confiscated. Matfrid was reinstated. In 834, while fighting Matfrid and Lambert I of Nantes, partisans of Lothair, Odo was killed as were his brother William, Guy of Maine, and Theodo, abbot of Saint Martin of Tours. [S746] Wikipedia, online http://Wikipedia.com, http://en.wikipedia.org/wiki/Odo_I,_Count_of_Orl%C3%A9ans. [S746] Wikipedia, online http://Wikipedia.com, http://en.wikipedia.org/wiki/Adrian,_Count_of_Orl%C3%A9ans. [S750] Allan J. Gillis, Descendants of Angus MacMillan, page 1. [S751] Allan J. Gillis, Descendants of Hugh (Hugh Thomas) MacDonelll, page 1. [S751] Allan J. Gillis, Descendants of Hugh (Hugh Thomas) MacDonelll, page 2. [S751] Allan J. Gillis, Descendants of Hugh (Hugh Thomas) MacDonelll, page 7. [S752] Allan J. Gillis, Descendants of John Angus Smith, page 1. [S757] Allan J. Gillis, Descendants of Alexander MacDonell, page 1. [S752] Allan J. Gillis, Descendants of John Angus Smith, page 2. Biography: Gerold of Vinzgau (also Vintzgouw or Anglachgau; d. 784/786 or 795) was a count in Kraichgau and Anglachgau. His daughter married King Charlemagne in 771. In 784 generous donations to the monastery of Lorsch by Gerold and Emma are recorded. Hildegard, born in 758, married King Charlemagne in 771.